Twilight Shimmer by Michael Kors - This limited edition fragrance for women is a new fruity gourmand version of the original Midnight Shimmer perfume. The latest scent from Michael Kors includes notes of red and violet fruits, plum, praline, sensual oud, and creamy woods. The original MK gold dust bottle is updated with a violet hue. Launched in June 2018 this new fragrance is available in an eau de parfum spray from Dillard's and Macy's. 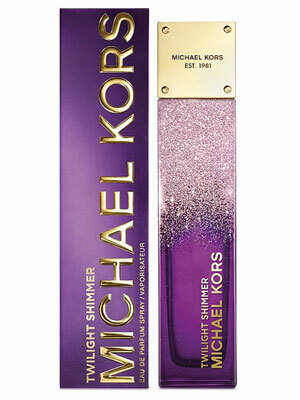 Package Design Original Midnight Shimmer gold dust bottle updated with a purple hue.